Close to Collinsville, Illinois, USA stands one of the most fascinating pre-columbian earthworks. 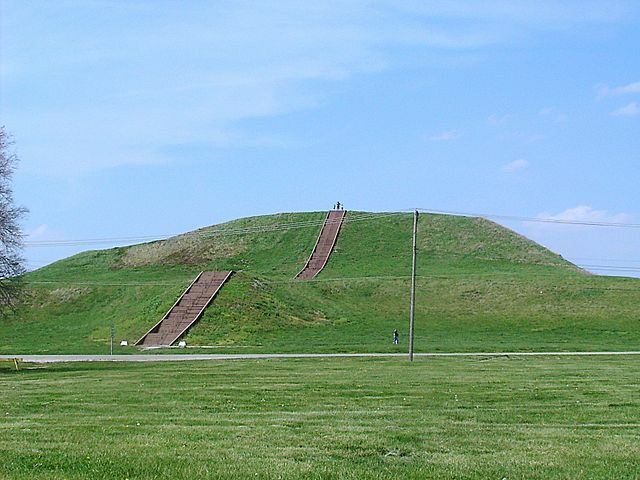 The so-called Monks Mound is the largest pyramid north of Mesoamerica. Although much of it is overgrown now and nature also took its toll, it is still not hard to guess that this structure was man-made. 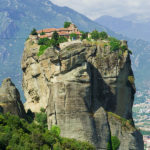 In its prime, it is calculated to have been 100 feet (30 m) high, 955 feet (291 m) long and 775 feet (236 m) wide. The ground area is roughly the same as the famous pyramid of Giza in Egypt. The Monks Mound was built around the year 900 and saw several hundred years of adding and modifying the structure. After 1400, it was abandoned and only around 1860, the Monks Mound started to become interesting to archeologists. The stairs on the picture are modern, but were built almost exactly at the spot of the original stairs.